Joshua: You are the light in my life, there is nothing I look forward to more (except sleep), than you walking through the door after work. You do SO much for us and you do all of it without complaining. You remind me of why I am important and you make me laugh everyday. You’re the best daddy, Henry and Peyton are truly blessed. You give us a perfect life. Henry and Peyton : You two are the most beautiful kids, inside and out. I never knew my heart could feel so much love. You make me laugh and smile every day. I have never been so tired and so amazed by anything. I want so much happiness for you both. I am overwhelmed that God chose me to be your mama. Bobbie: You always listen and that is everything. You always love, no matter what. You always tell me what I need to hear. You are such an important part of my life. I love you. This amazing Autumn weather: 60s and 70s in November? Incredible. It lasted well into November, I’m so thankful we had more than 2 weeks of warm Fall temps to enjoy. We were able to get so many Fall activities in and spent a lot of time playing outside and at the park. Our church (Saint John Vianney Catholic Church): We finally joined a parish in January and it is definitely feeling like home now. I always feel safe when we are there, it is a place where I know exactly what to expect, it’s unchanging. I joined the MOMs ministry a couple of months ago and have enjoyed attending every week and reading along with the book they’ve chosen. We are thankful for such a traditional parish and for a strong priest. It’s a great community to be apart of and I hope we are able to give more of ourselves to it. Washer and Dryer: Mizewell throw my dishwasher in as well. I grew up walking to the laundromat with my mom every Saturday, so having a washer and dryer in the house is a huge blessing. I love when I’m upstairs and I can hear the dryer going downstairs. It’s one of those sounds that bring me comfort. Without a dishwasher, I would never get any other chore done. Where we live: I love so much about where we live. It’s beautiful. Sunrises, sunsets, the land around us, the land we own, our garden, the quiet, etc. In the Spring it’s so green with so many wild flowers bursting all around us and in the Fall the colors are beautiful. It’s in such stark contrast to what I grew up around, that there is always something new for me to learn and experience (this year it was monarch caterpillars and butterflies!). We are just 35 minutes from downtown Indy, which always gives us a lot of options for different activities to do. Friends: My best friend forever, Kayleigh. I don’t need to write all the ways you have always been important to me because you know…but mostly I’m thankful we don’t hug and we both wear pants. gRegor, Shawn, Jeremiah and Mary Sue, you show up, you listen and you care. We all have busy lives but you’re people I love and know I can count on. To you other people (Sloth, Paul, Jessica, Steph and Sheryl..etc) who probably don’t realize how much of impact you have on my day just by listening and making me laugh, thank you! Libraries and books: We visit the library every other day (this is not an exaggeration). We go to story time, we go to play, we go to learn, we check books and movies out. It’s our little safe haven. Henry loves the “whybe”. He also loves to read, read and read. I’m so thankful that he is such a book worm. I get just as excited as he does about reading to him (although Dr. Seuss is wearing me out, without a doubt). I also love to read (I’ve finished 55 books this year, so far), it’s what I do with my free time (when nursing Peyton or when they are napping, or when I have a break from the kiddos). All the little big things: Hot water, a sleeping baby on my chest, good health, my down comforter, coffee, nap time, food, kisses, cuddles, parks, Target, prayer, hoodies, letters in the mail, music, Chick-Fila, football Sundays, game nights with Josh, sunsets, sunrises, slipper boots, falling asleep, Thai and the list goes on forever. 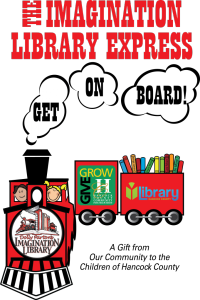 Have you heard of The Imagination Library? It was started in 1995 by the Dollywood Foundation and it sends 1 age appropriate book to a child every month for the first 5 years of their lives. That is 60 FREE books per child! This program is coming to Hancock County (where we live!) in 2016. This is the kind of program I dreamed of as a child. I can picture all the children that will be a part of this program, their sweet anticipation as the mail comes every day, hoping for a new book to read (THEIR very own book) and a new adventure to escape on. In Hancock County last year, 28% of children in kindergarten fell below literacy standards. This program could foster a love of reading for children. Children begin school with book handling skills and an understanding of letter and word concepts. In addition to these skills, those such as math scores and cognitive skills are significantly improved with participation in Imagination Library. Closing the “language gap” before age 5 is vital for reading success in school. A child’s brain grows to 80% of its adult size by age three, creating a critical window of opportunity for learning words and language. Reading experiences shared by children from diverse backgrounds upon entering kindergarten can “level the playing field” and help them develop socialization skills. Participants outperform non-participants on kindergarten literacy assessments. Hancock County Community Foundation is asking for help in their fundraising during the week of November 9th-11th (NOW!). Thanks to a grant from Lilly Endowment, every $1 donated during this week will be matched with .50 (from a pool of $100,000). The goal is to raise $2 million dollars over a 5 year period which would allow 3,500 children to receive 12 books a year, over their first 5 years of life. If you decide to donate and have any questions please ask me! And if you do donate, please let me know, I would love to thank you personally. And in case you don’t let me know, please understand that I (and all the children who will benefit from this program) am so grateful for your donation! Please share this post with your friends and family to get the word out!